When you're looking for reliability, you know to look to Subaru first. When you look at Capitol Subaru, you can rely on the next vehicle you find in our selection of Certified Pre-Owned vehicles. Our Certified Pre-Owned Program at Capitol Subaru is more than just a section of our inventory--it's a part our commitment to serving you! A Subaru Certified Pre-Owned vehicle may not be brand new, but it offers the same dependability. In fact, all Certified Pre-Owned Subaru vehicles must pass a 152-point Vehicle Safety Inspection, and any part that does not meet the most stringent standards must be replaced or repaired. Not only does every Certified Pre-Owned Subaru go through a 152-point vehicle inspection, each vehicle comes with a detailed CARFAX vehicle history report. View our Certified Pre-Owned Vehicles here to see for yourself what we have to offer! You can trust a Subaru Certified Pre-Owned Vehicle from Capitol Subaru! As dependable as Subaru vehicles are, we want to offer complete peace of mind for all circumstances. That's why Subaru Certified Pre-Owned Vehicles are backed by 7-year/100,000 Mile Powertrain Coverage. Any issue faced by the engine, transmission, and all-wheel drive is covered by the Powertrain Coverage Plan. What Does the Powertrain Coverage Plan Cover? Critical components of the engine and engine block are covered by the 7-year/100,000 Mile Certified Pre-Owned Powertrain Plan. This includes the fuel injection system, camshaft, flywheel, cylinder heads, intake manifolds, valve covers, drive belts, oil pump and pan, oil sending unit, motor mounts, gaskets, seals, and all internal lubricated parts. Transmission components covered by the Subaru 7-year/100,000 Mile Certified Pre-Owned plan include the transmission, torque converter, axle case, seals and gaskets, and the transmission mount. Your legendary Subaru Symmetrical All-Wheel Drive system is covered by our Subaru 7-year/100,000 Mile Certified Pre-Owned Plan. This plan covers the final drive housing and rear differential assembly, axle shafts, velocity joints and boots, rear torsion bars and control arms, hub bearings, seals and gaskets, center support bearings, double offset joints, universal joints, and more. 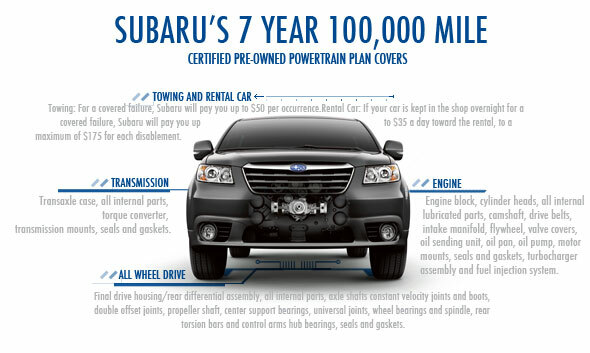 What Other Benefits Come with a 7-Year/100,000 Mile Subaru Certified Pre-Owned Plan? In addition to covering all major components, the 7 year/100,00 Mile Certified Pre-Owned Plan offers much more. You'll also get coverage of $50 per occurrence if your vehicle needs to be towed, $35 per day for a rental, and up to a $175 total. Ask our sales and finance representatives about additional plans like the Subaru Added Security extended service plans, proudly backed by Subaru of America. What Is Covered In the Subaru Classic Plan? In addition to all the parts covered in the Powertrain Plan, the Subaru Classic Plan covers the steering components, air conditioning, electrical, brakes, cooling, and fuel system. This plan is a great way to make sure your Certified Pre-Owned Subaru driving experience lasts and remains cost effective. For a coverage plan on your Subaru Certified Pre-Owned vehicle that most closely matches new vehicle bumper-to-bumper coverage, choose the Subaru Gold Plus Plan. This Added Security Plan covers most maintenance services and offers a $500 allowance to cover meals and lodging if your Subaru breaks down while you're out of town. With additional benefits like 24-hour emergency assistance, this plan adds incredible value to your Subaru Certified Pre-Owned vehicle. Here at Capitol Subaru, we're passionate about matching you and your Subaru with the right added security plan. Added Security Plans enhance the value of your vehicle--remaining coverage on your Subaru can be transferred when you sell your vehicle, or you can apply for a prorated refund if you choose to cancel your coverage. If your Subaru Added Security Plan has a deductible, you'll only pay it once during your repair visit. Plus, you can add an Added Security Plan even if your vehicle is still under basic warranty. Subaru also offers two Maintenance Plans, which can be added to the cost of lease payments, with roadside assistance. Maintenance Plans keep maintenance for your Certified Pre-Owned Subaru at a locked in cost. Here at Capitol Subaru, where you get your way on the parkway, we're passionate about the quality of Subaru Certified Pre-Owned Vehicles. After passing a 152-point inspection and matched with Carfax vehicle history report, Subaru Certified Pre-Owned Vehicles show that love really can strike twice. To help you save on maintenance and repairs for your Certified Pre-Owned Subaru, ask about our Added Security Plans and Maintenance Plans. Check out our complete selection of Subaru Certified Pre-Owned Vehicles! Or, find a great deal in our new Subaru specials and our variety of used vehicles of other makes. Our sales professionals and finance experts make buying a Subaru simple--we offer new model discounts, easy leasing, and great low financing (get approved today)! We're proud to keep Subaru drivers on the road with our great deals on Subaru maintenance performed by factory trained technicians. We also offer huge savings with specials on genuine Subaru parts and accessories. For more information, contact us at (888) 698-1973 and visit us at 3235 Cherry Ave NE, Salem, OR 97301, where we're proud to serve West Salem and Four Corners, Oregon.